Bangkok, the capital of Thailand was founded in 1783 by King Rama I of the Chakri Dynasty. It used to be called Bangkok or city of the wild olive, however in the Thai language it is called "Krung Thep" meaning City of Angels. The complete name which is the world's longest name for a city, is Great City of Angels, the Supreme Repository of Divine Jewels, the Great Land Unconquerable, the Grand and Prominent Realm, the Royal and Delightful City of Nine Noble Gems, the Highest Royal Dwelling and Grand Palace, the Divine Shelter and Living Place of the Reincarnated Spirits. 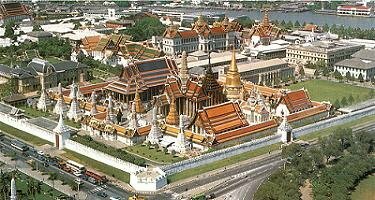 Today, 10 million people live in Bangkok and the city is a mixture of East and West, the ancient and modern. Bangkok's temples are distinguished by the emphasis put on the decoration of every possible surface ; such decor may consist of covered in glazed tiles as with the walls of Wat Rcajabopitr ( above ) , in mother - of - pearl inlay as the famed door of Wat Po ( right ) or with mural paintings as in the interior of Wat Bowornivet ( left ) . Temples often enshrine statues that were cast long before the foundation of the city and many were moved from their original locations to enhance the power and the wealth of the new capital. The Buddha image shown here is one of the masterpieces of Sukhothai art and was cast at the end of the Sukhothai era. The architectural face of Bangkok has reflected many styles, some of which seem to defy any rational definition of "style". At top is the facade of the Old Customs House patterned after neo - classical European architecture of the late 19 th century which was itself based on neo - classical Greco - Roman styles. In the centre is the penthouse of a new apartment building which also appears to be derived from Greco - Roman architecture as well as a little bit of everything else. The majority of recent construction projects are best represented by the bottom picture. A local critic once complained that Bangkok's modern architecture suffered from AIDS: Architectural Identity Disaster Syndrome. Information from : Thailand book.